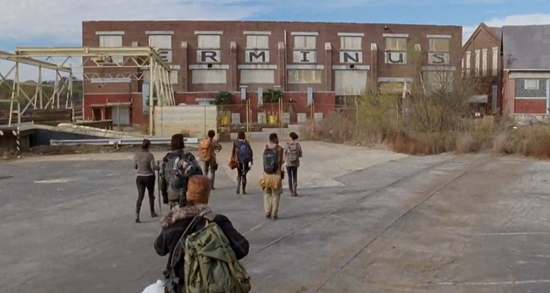 Terminus was a location in The Walking Dead where the characters met up with a new group. They arrive, but will they really Survive? From Knight and Day - "There are a few common DIP keywords to listen for. Reassuring words. Words like Stabilize, Secure, Safe. If they say these words, particularly with repetition, it means they are going to kill you. Or intern you somewhere offshore for a very long time." We now know much more about Terminus after the Finale and it is not good. They are a bigger badder version of the cannibalistic hunters seen around this time in the comics. 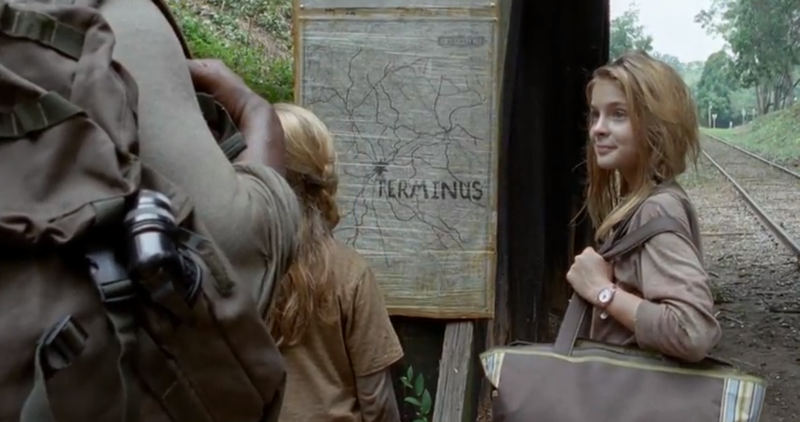 Skip to the bottom of the post for analysis after the finale and the full history of Terminus. When Tyreese, Daryl, Bob and Michonne are on the supply run to get medical supplies they hear a brief radio blip that says something about "Sanctuary for all." 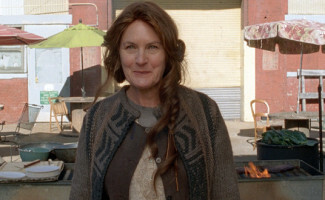 There is a sign that is encountered by Tyreese, Carol, Lizzie, Judith and Mika as they walk along the rail road tracks that has similar language. "Sanctuary for all. Community for all Those who arrive survive." This sign also says Terminus. Rick, Michonne, and Carl encounter a similar sign draped over a rail road car. 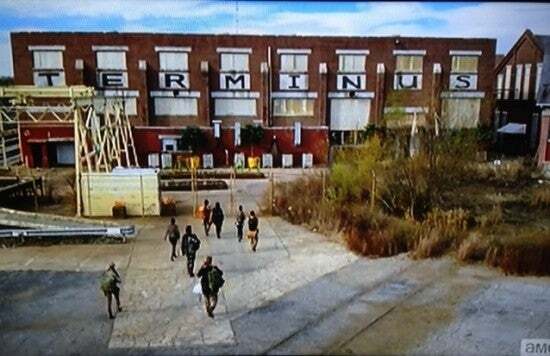 Terminus means "the end of the line." That sounds pretty foreboding but in this case it is also a literal reference to where all the rail lines end. In Georgia terminus was a reference to Atlanta where all the rail lines ended.. Interesting though if you hold a map of Georgia over the one presented you Terminus appears to be in Macon not Atlanta. The survivor (Chris) of a walker attack that Tyrese helps are the first ones to say anything about Terminus. There opinion is that Terminus was safe and that Tyrese should take the children there. 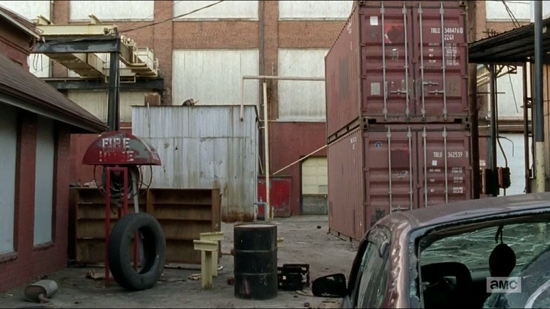 It is unclear if this person had infact been to Terminus, and why he was not there if it was so safe. However, the guy seemed to have very little lie about as he was dieing. It should be noted his name Chris is also the name of cannibalistic hunters in the comics. The fact that Terminus can radio broadcast plus make all these signs points to a large group with a high level of infrastructure and resources. They have much more resources than their hunter counterparts in the comics. The cannibalistic hunters in the comics were a pathetic group that hunted down stragglers of other groups. When confronted by Rick they were completely and instantly massacred. 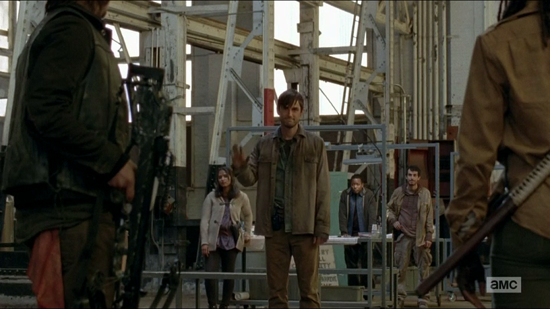 The group at Terminus in the show seems much larger and better outfitted than that group. Those who arrived at Terminus (Glenn, Maggie, Abraham, Tara, Rosita, Bob, Sasha, Eugene) entered a quaint structure filled with little garden beds. Inside was a woman who says her name is Mary. She looks nice....TOO NICE. Disturbingly she is cooking over a giant grate grill that looks somewhat person sized. My feeling is that we are going to meet the hunters very soon. However, my question now is how will the hunters deal with such a large well armed group? Hi I'm Mary, and I want to eat you :) ? Is that a steak? Here is the new Promo Images for the Walking Dead Finale: Foreshadowing of not good things to come. What is Terminus? Are they cannibals? The answer to this is not known for sure, however I absolutely think they are cannibals. Why would you keep the people you trap alive if not to eat them. The hunters in the comics would amputate meat from a person piece by piece to keep the person alive so they would not turn. With no refrigeration this was how they decided to store food. With the large group of Termites I doubt they cut people up in a similar fashion. Likely, that Terminus eats the entire person pretty much all at once. Mary seems to feed newcomers meat and that is the most rare of foods. Where does this meat come from if not from bodies of trapped victims. There are no domesticated pigs or cows around and at this point we have seen quite a lot of Terminus. 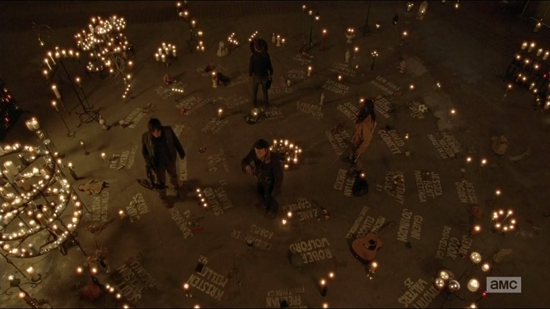 The weird ritual/church room that is filled with people's names. This weird room almost looks like the termites are saying sorry to people who have died. It goes beyond simply paying their respects. On the walls is written the words "Never Again" and "We First" this may point to an earlier disaster that forced the group to become cannibals. Why do they want people to come here? They obviously don't want the company if they throw the first group into a rail road car. Also you can hear people screaming for help in other rail cars that Rick and Daryl pass by. Rick tells Daryl to keep going because he thinks they can escape and get back to their guns. The whole overall Terminus is a trap thing. The Termites have gone to huge lengths to create this very elaborate trap to lure people in, then trap them, alive and without weapons. If they wanted to make them into soldiers/servants can you really come back from trapping people like that? Could you ever trust someone who did that? Gareth says "We have lost your trust" something right before he gives the signal for everyone to start shooting. He seems very aware of people's emotions and gaining people's trust. Terminus is likely his master plan as it just seems to fit his character to a T. He knows once trust is lost, it is gone forever. There is a huge pile of human looking bones they run by. These bones look like meat was freshly cut from them not old rotten walker bones. I do not know if any of the characters saw the bones so Rick may still not know why they have been caught. They never ask or use the names of their prey. At one point Rick tells Carl not to name the Pigs because he will get attached. Termites seem to employ the same strategy. Gareth refers to them based off of their weapons/role "Ringleader, Archer, Samurai." He does not want to know their name. He may also play D&D (Dork joke). Powdered milk cartons. There are powered milk cartons in the train car. It seems the termites are using the powered milk to keep their prisoners alive until they are ready to be butchered. Terminus starts out as a small group but people following the tracks keep arriving. They secure the area and try to farm but no matter what they do people keep coming. They begin to run out of resources and start to force people away. After battles with other groups the Termites are dieing from both violence and starvation. One battle with people they had let inside is particularly brutal and the group barely survives. The group is broken, distraught and weak. Gareth a psychologist/marketing guru comes up with a solution. Food is everywhere he says it is the OTHER people, the people that would harm them, and use them. The Other people that have brought them so much pain. While, the warrior people on the road seem tougher than the peaceful Termites they can use their intelligence to outwit them. He teaches them that they can lure, trap and eat the people coming down the tracks. Never again will they put others before themselves from that point on it is "WE FIRST". He puts the words "We First Always" and "Never Trust" on the walls of a room and makes the room into a church/memorial. In this room the group will remember the pain of the massacre and vow to never let it happen again. Eating the people that come down the tracks effectively makes the people into a resource they can harvest. The group steals their items, and their meat and grows stronger. Occasionally, they even let a person or two join. When people stop coming down the tracks Termites sacrifice their own people and write their names into their church. As the group grows in strength from the meat and resources of their victims they begin creating newer and newer ways to lure people into Terminus. Using signs and even radio broadcasts they make their net wider and wider. Likewise packs from Terminus search the countryside for additional resources and for easy victims to trap. This is why so much of the countryside has no people or resources. One of these packs is led by a man named Chris. His group is overwhelmed by walkers and he is saved by Tyrese. He decides the best way to help Terminus is to send more victims their way and he tells Tyrese to go there. The overall philosophy and marketing of Terminus continue to grow and become more insidious under the tutelage of Gareth. Gareth teaches the members how they need to appear to be SAFE and welcoming. The people coming down the road are rough, paranoid warriors and to get their guard down everything at Terminus must be perfect. He adds to the effect by adding flowers and gardens to the front of Terminus. He also sets up tables with colorful awnings giving impression of a cafe from the old SAFE times. Even the thick brick walls that guest enter into make Terminus seem safer and secure. These symbols draw upon old nostalgic memories from a time when things were in fact SAFE. Food yay YUM, hey where did you get steak from? Gareth teaches Terminus that they must have an open gate, we must allow people to keep their weapons and immediately give them food. The welcome groups are made up of kind faced Termites who are expert greeters who overflow with kind and welcoming feelings. The Termites check people for hidden weapons but always return the Other People's weapons back to them. This allows the Termites to know exactly what weapons are on each person but also reassures the person that the termites are good. The Other People can then be easier disarmed when the time comes. The flowers, the open gate, the gardens, the greeters and the gift of food. The overall effect is to get them to lower their guard and lure the Other People deeper into the trap. After the food, the socially disarming Gareth gives the newcomers a tour, he explains the church and leads them along until eventually he locks them in a room, where they can only run one way. The victims will follow the path like rats in a maze. Gareth teaches the Termites they must build the trap so that the people trap themselves, without the ability to harm the termites or themselves. They can not kill the OTHER people because then their bodies turn into zombie or rot. Terminus has enough energy for an occasional radio broadcasts but not enough for constant refrigeration. The Termites need to keep them alive right up to the point where they are ready to butcher them. They construct a path that funnels their victims through a series of passages right out into a kill field where the termites have an overwhelming advantage. The labyrinth that the victims travel does not appear to be a trap, simply a series of passages. The passages / doors are marked with an "A" if it is part of the Trap. The Trail of "A"'s lead the group along the desired path. Sometimes the Termites will simply walk guests along this path as a tour of the facility, other times they will violently push them along by firing at their guests feet pushing them along the trail but never killing them. Once they are out in the field they disarm the people and force them into one of many rail road cars. The rail road cars can be moved up and down the tracks and serve as mobile jail cells to store their victims until they need them. They put their victims on a powder milk diet which keeps them alive longer but uses little of Terminus's resources. When they need meat they pull victims from a car, butcher them, and eat them. The gardens around terminus are in fact spice gardens and not vegetable gardens. These spices help to make the meat nice and tasty. Terminus continues to grow using this strategy. The country side is depleted of its populace as the Termites feast on them. Then one day one of their victims surprises them by using the back door. He then surprises them again by seeing through their charade early. One of the termites dies but they still manage to trap the bizarre group. A ringleader, a samurai, an archer and a son Gareth jokingly calls them. Then everything changes, the ringleader ends up knowing the other victims in the cell he is placed in. He is more than a ringleader of a small pack of warriors, he is a leader of a former colony. He has grown and evolved to be just as brutal as the Termites. He understands traps, and knows how to reverse one. The Termites have just trapped themselves. It is like when Rorschach went to prison. The untrappable monster is in your trap, but is it really trapped?